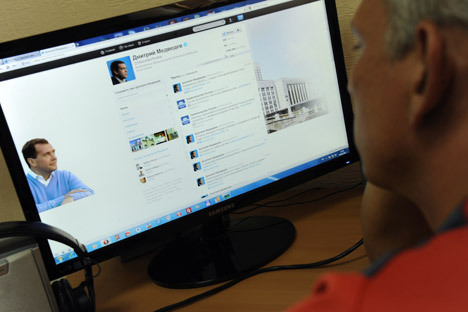 Bloggers have become a fixture on Russia’s political scene. Almost every governor, mayor or party official has a blog these days, though few have more than a thousand followers. RBTH takes a look at successful virtual political diaries and the real people behind them. Popova was greatly surprized: she had never blogged about politics, only about travel and her Persian cats that, amazingly, attract over 1,000 followers. The truth was soon revealed. It turns out that the press secretary had invited her to blog on behalf of the district’s head. The official could not seem to shed the habit of bureaucratic speak, which Popova managed to translate into normal language. But the official balked: “That’s not my style. What would my colleagues say?” he fumed. Popova did not get the job, yet the district head got his blog – which reads more like a collection of press releases than a live diary. “In principle, a politician or a mayor doesn’t care about the entire Internet audience. It’s O.K. if their blog is only perused by journalists, party comrades, and subordinates trying to figure out their boss’s mood on a given day,” said Marina Reznikova, press secretary of the permanent representative office of the Altai Territory. Digital diplomacy: Threat or opportunity? Almost every governor, mayor, or party official has a personal blog but readers normally have little trust in such bloggers. According to a Profi Online Research poll of Russian Internet users to gauge their attitude towards blogging by prominent politicians, 57 percent of the respondents viewed such blogs merely as a means for directing complaints or requests to officials, while 21 percent thought political blogs were an image-enhancement ploy. The blogosphere is no different from real life in that controversial figures arouse interest. Alexei Navalny’s blog has long been the third most widely read journal among the top ten. But Navalny did not start out as a politician. He attracted readers with his offbeat past as a former FSB agent and with his muckraking articles. He gained popularity through the blogosphere. Yet official politicians are unlikely ever to make it to the top ten. LDPR Chairman Vladimir Zhirinovsky’s blog is second in popularity after the president’s and the prime minister’s page, but people read it not so much out of interest in politics as out of curiosity about the flamboyant politician’s colorful language. State Duma deputy, Dmitry Gudkov, blogs by himself and posts almost daily, although he is not after maximizing his audience. Quality has been gradually squeezing out quantity as far as the blogosphere is concerned. According to Gudkov, the audience often helps with the inquiries. There are volunteers willing to travel, photograph and look for documents and evidence. That is how the number of subscribers grows. Perhaps this is also why State Duma deputies want to rein bloggers in. A legislative amendment has been proposed to equate blogs with more than 10,000 verified subscribers with mass media outlets. Bloggers respond with smiles, claiming that the web has its own laws and that is it impossible to change the situation by official decree.